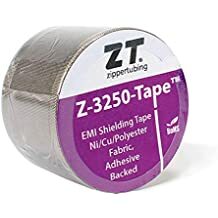 Z Wrap Rpu - Lightweight Jacketing - Wire And Cable Bundling - Products - ZT | Zippertubing Co.
0.25" 0.375" 0.5" 0.625" 0.75" 0.875" 1.0" 1.125" 1.25" 1.375" 1.5" 1.625" 1.75" 1.875" 10.0" 11.0" 12.0" 2.0" 2.125" 2.25" 2.375" 2.5" 2.625" 2.75" 2.875" 3.0" 3.125" 3.25" 3.375" 3.5" 3.625" 3.75" 3.875" 4.0" 4.5" 6.0" 6.375" 8.0"
Zippterubing’s RPU-17 Polyurethane wire and cable jacket will far exceed your expectations. Z-Wrap® (RPU) is an economical, lightweight, non-PVC cable management solution that is best suited for locations where PVC materials are restricted. This product is versatile and well suited for any round, flat or custom engineered cable applications. With a high tear resistance and strong abrasion resistance properties, Zippterubing’s RPU-17 Polyurethane wire and cable jacket will far exceed your expectations. Simply wrap the Z-Wrap® (RPU-17) around your installation, tear off the adhesive paper liner, and enjoy. A strip of high-strength, specially-formulated Acrylic adhesive is bonded to one edge and provides a secure and flexible closure. This style of closure allows installation without the need for tooling on assemblies that do not require re-entry after the installation and where a pull through jacket is not going to work well for your specific application. Z-Wrap® is ideal for discrete wires, wire harnesses, hoses, and other applications where flexibility, strength and abrasion protection is needed. Custom lengths, widths and closure options are available. Cable Diameter 0.25" 0.375" 0.5" 0.625" 0.75" 0.875" 1.0" 1.125" 1.25" 1.375" 1.5" 1.625" 1.75" 1.875" 10.0" 11.0" 12.0" 2.0" 2.125" 2.25" 2.375" 2.5" 2.625" 2.75" 2.875" 3.0" 3.125" 3.25" 3.375" 3.5" 3.625" 3.75" 3.875" 4.0" 4.5" 6.0" 6.375" 8.0"
RPU-17 is a medium-weight, fire retardant poly(ether) urethane-coated polyester-fabric jacket material designed to provide a tough, flexible, non-PVC cable jacket. The Polyester-fabric core makes RPU-17 ideal in applications where a high degree of tear resistance is required. It can be combined with most Zippertubing EMI Shielding materials to create EMI-hardened jacket assemblies. Custom designs utilizing mechanical zippers, hook-n-loop, stainless steel snap buttons, pressure sensitive adhesives and track closures are available. RPU-17 is white in color, making it ideal for medical and clean room applications where PVC-based materials are restricted. A thin, clear, Acrylic transfer adhesive which is used to create permanent jacket closures on flexible Polyvinylchloride (PVC) materials. This specially formulated transfer adhesive and is unaffected by PVC plasticizer migration and will not dis-bond over time due to plasticizer volatilization. 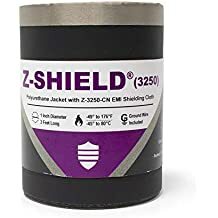 Once sealed together this adhesive creates a strong permanent bond that cannot be reopened (after several weeks) without structurally damaging the base material. Attempting to remove and reset this adhesive after initial placement will destroy the strength of the material.